Kernel is offering multiple preorder tiers, with prices as high as $1200. Preordering videogames has been a thing for years, and now preordering movies based on videogames is, too. Kernel, a site that provides “curated offers on anticipated movies, games and events,” is offering seven different packages for the Assassin's Creed film, with prices ranging from $15 to—*rubs eyes incredulously*—$1200. The $15 base package gets you a ticket, a digital copy of the script (delivered when the film comes out), and “behind-the-scenes extras.” For $25, you can add a t-shirt to the package, and $40 gets you all of the above plus a “collectible” digital watch. At the upper end of the scale, there's a $600 package featuring a “Premiere Scale Statue” of Aguilar, and one for $1200 that includes a full-scale replica of the crossbow used in a “pivotal scene." “A few weeks before the movie's release date, the movie studio and the theaters will release showtime information. The moment that happens, we will send you a code unique for you to pick your theater and seats on our ticketing partner's website, MovieTickets.com,” the FAQ explains. After that's happened, you'll be able to select your seats (assuming the theater in question supports designated seating, I suppose) and add more tickets to your purchase. Now all they have to do is figure out how to cram some DLC in there. Alternate endings for $2 each, maybe? Remember, you read it here first. And if you think nobody's going to fall for this, think again: Kernel originally offered eight preorder tiers, but the $50 package, with a Funko Pop and “4-6 curated collectibles,” is already sold out. 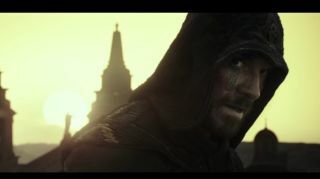 The Assassin's Creed film hits screens on December 21. Have a look at the first trailer here.